It can be hard to organise a girly get together - everyone lives busy lives and it can be difficult to negotiate shift patterns, work, travel and childcare commitments. We got there though and last week I met up with some of my oldest school friends and we all set off excitedly towards Beacon Hill Farm Spa for some rest, relaxation and a much needed catch up. 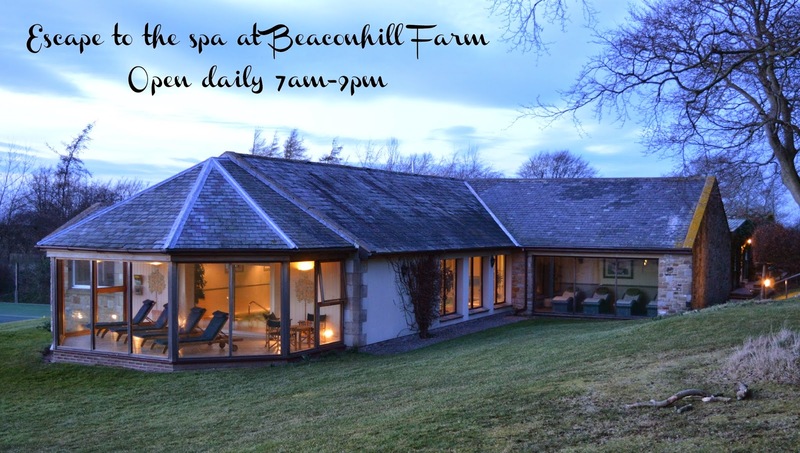 Beacon Hill Farm Spa sits slightly off the beaten track in the middle of the Northumbrian Countryside near Longhorsley. We arrived at approximately 3pm and were greeted by Chris who runs the farm with his dad Alun. We were advised to remove our shoes at reception and as we we given a bare foot tour, we knew we were in for a treat. The Spa is open from 7am - 9pm 365 days per year and is available for guests who are staying on the farm (as we were) to use as they please at no additional cost. Alternatively, you can book in for one of the spa's tempting pamper packages which start at just £60. My friends had surprised me and booked me in for a full body chocolate orange massage (I know- I have fantastic friends). We helped ourselves to refreshments in the garden room and relaxed with a complimentary magazine as we waited for our therapist. The views over the tennis courts and the countryside beyond were perfectly peaceful and really put us in the right mindset for our day. My therapist arrived soon after and I followed her through to one of the treatment rooms where I was asked to make myself comfortable under the warm fluffy towels. You didn't need to ask me twice! What followed was an hour of one of the best massages I have ever enjoyed. My therapist was clearly very experienced and she worked the knots from my back and shoulders I could feel the tension slipping away. The chocolate orange cream is designed to help you relax and unwind whilst releasing endorphins to boost your mood. The hour long treatment was certainly indulgent and as I quietly lay there listening to the birds chirping outside, one hour felt more like three. My treatment ended with a mini indian head massage and the chance to sit and 'just be' with my thoughts and a glass of water. Whether you are a stressed out parent, workaholic or simply a busy bee, I cannot recommend a treatment at Beacon Hill Spa enough to help you unwind and escape. After my treatment I met my friends in the Laconium therapy room. This room is unique to the Uk and features heated floors and four heated beds which have been especially imported from Baden Baden. The room encourages a feeling of deep relaxation and is a feast for all of the senses. Sinking into the warm beds whilst listening to the gentle background classical music, inhaling the aromatherapy oils that subtly fill the air and looking out over the spectacular Northumbrian countryside is probably the most relaxed I have felt in A LONG time. This room alone is worth visiting the spa for and if we didn't have so much gossip to catch up on, I'm pretty sure I would have drifted off to sleep. Next up we spread our time between the black granite steam room, the Canadian Redwood sauna and bubbling jacuzzi. A few of us were even brave enough to try the freezing cold cascading shower inbetween (not me though). We left feeling like we had lost a few pounds (I don't know if this is true!) and we all had a healthy glow to our skin again. We spent about three hours in the spa altogether and could have easily spent more (we had afternoon tea waiting for us in our cottage). 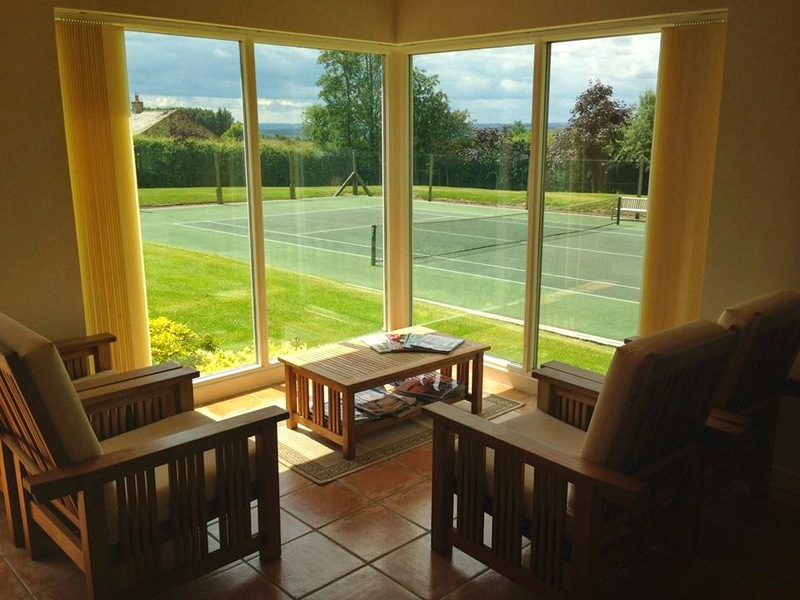 There is also a fully equipped gym and a tranquil orangery with loungers, chairs and more stunning Countryside views. If you are looking for somewhere to really relax and unwind, I would highly recommend Beacon Hill Farm Spa. Staying in one of the nearby cottages means you can also access the spa at night and it is simply beautiful lit up against the night sky. Contact 01670 780 915 or visit here for further information. A trip to Beacon Hill Spa formed just a small part of our stay at Beacon Hill Farm. Stay tuned for our next instalment next week which will feature the rest of our stay. It was amazing - wish I could be there now instead of looking out into our rainy street! Wow this looks amazing, I can't believe I've never heard of it as I'm always on the hunt for places to go with the girls and this is perfect! It's a gorgeous place for a girly getaway. We had a lovely day and were really looked after. Looks like my kind of fun. I love going to the spa. I only manage one trip a year, but that's better than not going at all! This spa looks amazing! Oh yes, one trip a year better than nothing and it is definitely something to look forward to. I didn't want to leave! Yes I agree, It's such a good selling point for staying on the farm. Wow this sounds like absolute heaven! Can't wait to read the next bit ... Afternoon tea! This sounds amazing! I can't imagine being able to escape to do anything like this for another few years until my little boy is a bit older. Something to really look forwards to though when I can!! Looks beautiful! And the idea of a massage..I'd kill for that right now! I have to say that looks heavenly, what a gorgeous place. The treatments sound fabulous.